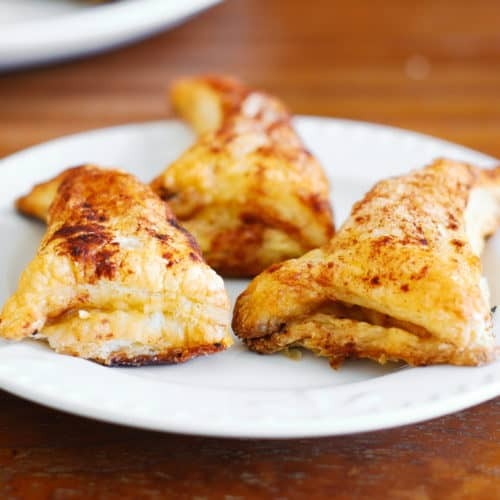 Cinnamon apple puff pastry turnovers that look like wizard hats – easy dessert, perfect for Halloween! 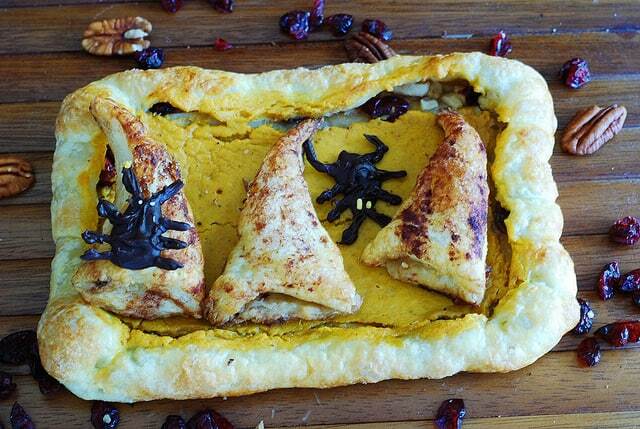 Yes, finally, here is my final recipe in the Halloween recipe series: cinnamon apple pockets, made out of puff pastry, made to look like wizard hats. I hope they do look like wizard hats. To me they do look like wizard hats, but it might be my wishful thinking because I’ve been staring at them for too long. Below are some step by step photos that are helpful for this simple recipe. 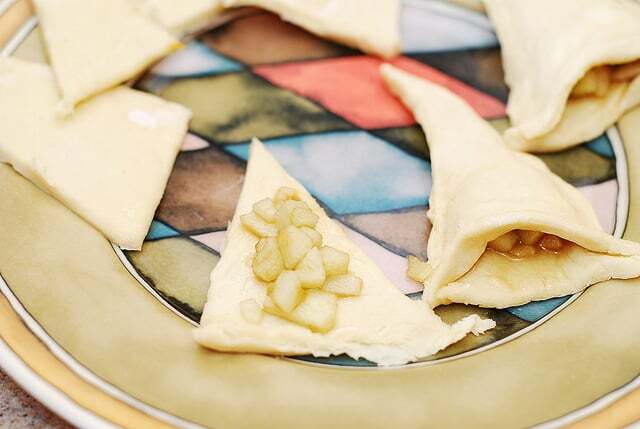 1) Preheat oven to 415 F.
2) Cut puff pastry sheet into 3 equal rectangles along the fold lines of the pastry (as you know the pastry is folded in 3 parts, so just separate those three). Cut each rectangle into 8 or 9 triangles. 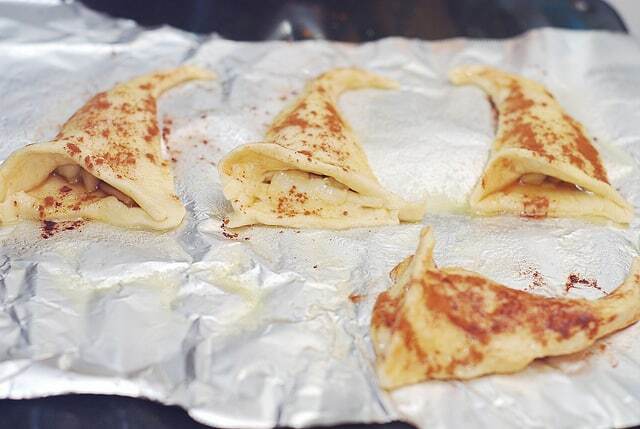 3) Chop apple finely, mix with brown sugar and cinnamon. Let apples sit to get juicy. 4) To make each wizard hat: place 1 triangle on foil or parchment paper. Fill with a little bit of chopped apples. Place another rectangle on top, seal the edges with your fingers. Elongate the top portion of the “hat” and bend it to the side. Fold bottom portions of the triangles up to form a hat brim. Brush the top portion of each hat with egg wash. Sprinkle hats with cinnamon and sugar. 5) Line baking sheet with parchment paper. Transfer hats to baking sheet. Bake for about 20 minutes until hats puff up and get golden brown. 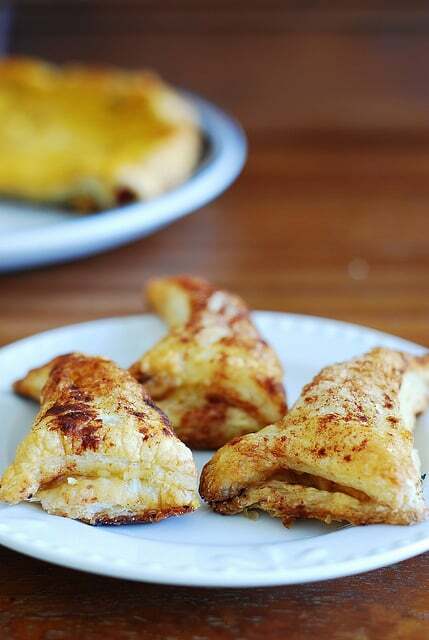 Cinnamon apple puff pastry turnovers that look like wizard hats - easy dessert, perfect for Halloween! 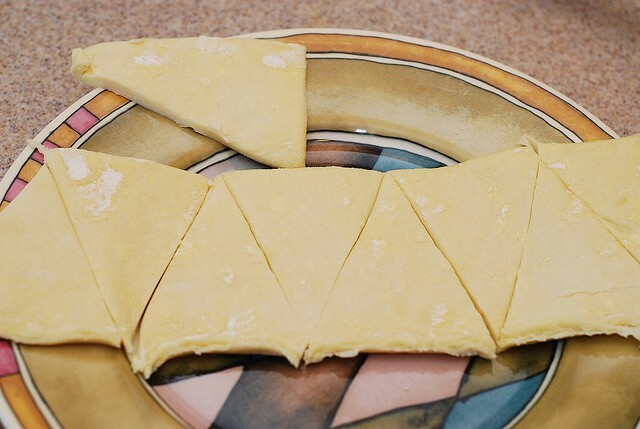 Cut puff pastry sheet into 3 equal rectangles along the fold lines of the pastry (as you know the pastry is folded in 3 parts, so just separate those three). Cut each rectangle into 8 or 9 triangles. Chop apple finely, mix with brown sugar and cinnamon. Let apples sit to get juicy. To make each wizard hat: place 1 triangle on foil or parchment paper. Fill with a little bit of chopped apples. Place another rectangle on top, seal the edges with your fingers. Elongate the top portion of the “hat” and bend it to the side. Fold bottom portions of the triangles up to form a hat brim. Brush the top portion of each hat with egg wash. Sprinkle hats with cinnamon and sugar. Line baking sheet with parchment paper. Transfer hats to baking sheet. Bake for about 20 minutes until hats puff up and get golden brown. 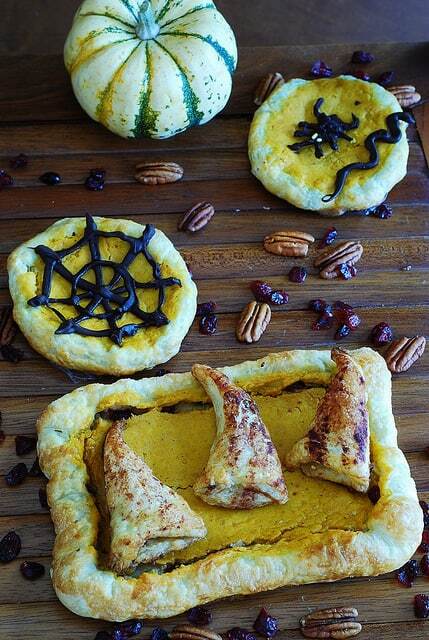 What a cute idea for a festive treat! 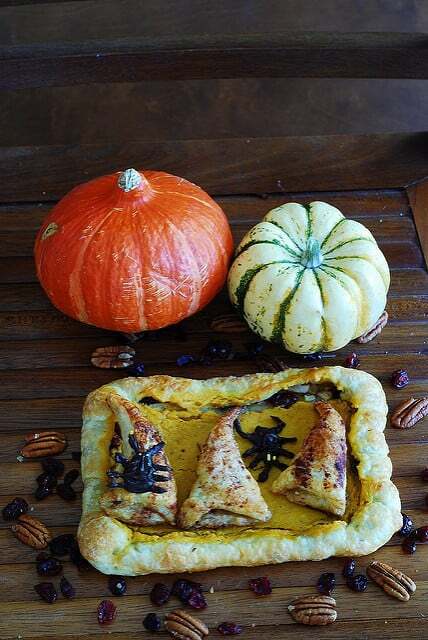 Easy enough to make at the very last minute too, which is wonderful since that’s always how my Halloween celebrations end up coming together. Absolutely, that’s the beauty of it – easy and quick! Julia, the hats are adorable! And apple, cinnamon and puff pastry? That’s all *I* need to be happy!